1 The Emergence of Civil Rights as a National Issue When thousands of blacks marched through downtown Birmingham, AL, to protest racial segregation in April 1963, they were met with fire hoses and attack dogs unleashed by Police Chief Bull Connor. 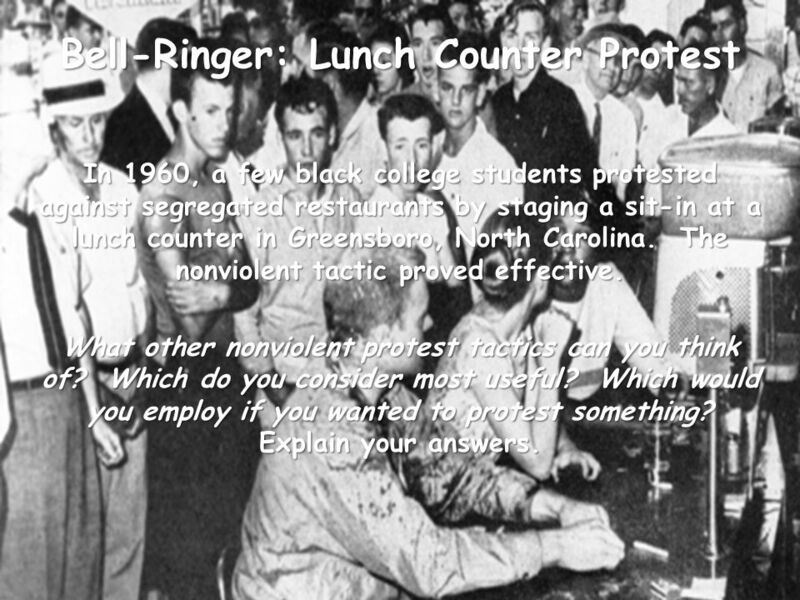 2 Bell-Ringer: Lunch Counter Protest In 1960, a few black college students protested against segregated restaurants by staging a sit-in at a lunch counter in Greensboro, North Carolina. The nonviolent tactic proved effective. What other nonviolent protest tactics can you think of? Which do you consider most useful? Which would you employ if you wanted to protest something? Explain your answers. 3 Although the struggle for civil rights had preoccupied African Americans since Reconstruction (1865-1877), it took on a new urgency during the 1940s. Poor treatment of black soldiers during WWII and violent crimes against blacks after the warmany of them veteranssparked anger.Although the struggle for civil rights had preoccupied African Americans since Reconstruction (1865-1877), it took on a new urgency during the 1940s. Poor treatment of black soldiers during WWII and violent crimes against blacks after the warmany of them veteranssparked anger. At the same time, black expectations had been raised by wartime opportunities and symbolic victories like Jackie Robinson breaking the color barrier in baseball in 1947.At the same time, black expectations had been raised by wartime opportunities and symbolic victories like Jackie Robinson breaking the color barrier in baseball in 1947. During Harry Trumans presidency, sympathies for civil rights were reinforced, especially since many of them were Democrats. Trumans presidency saw a movement toward a more expanded federal government role in civil rights legislationwhich would come about by the 1960s. 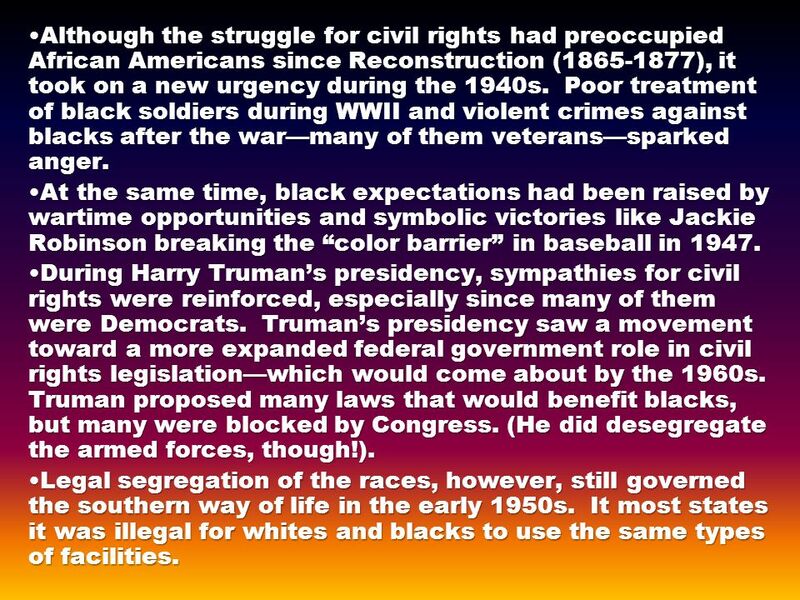 Truman proposed many laws that would benefit blacks, but many were blocked by Congress. (He did desegregate the armed forces, though! ).During Harry Trumans presidency, sympathies for civil rights were reinforced, especially since many of them were Democrats. Trumans presidency saw a movement toward a more expanded federal government role in civil rights legislationwhich would come about by the 1960s. Truman proposed many laws that would benefit blacks, but many were blocked by Congress. (He did desegregate the armed forces, though!). 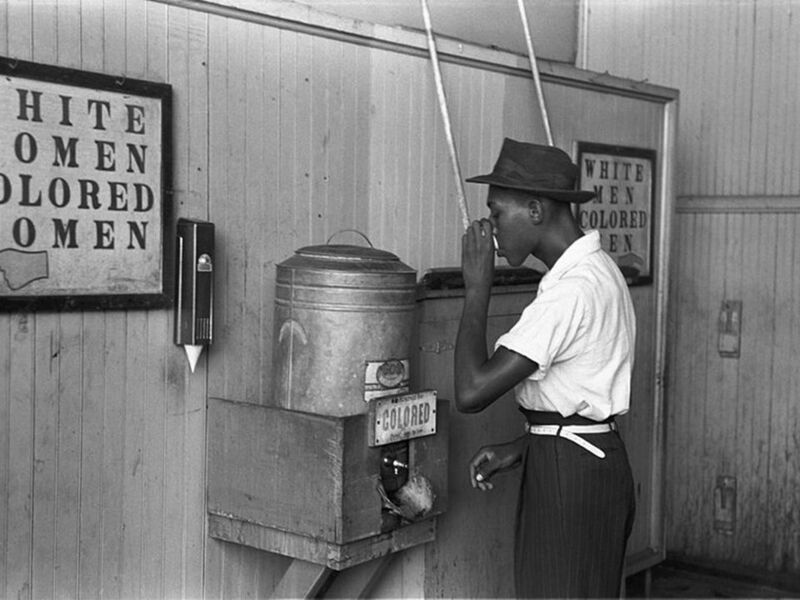 Legal segregation of the races, however, still governed the southern way of life in the early 1950s. 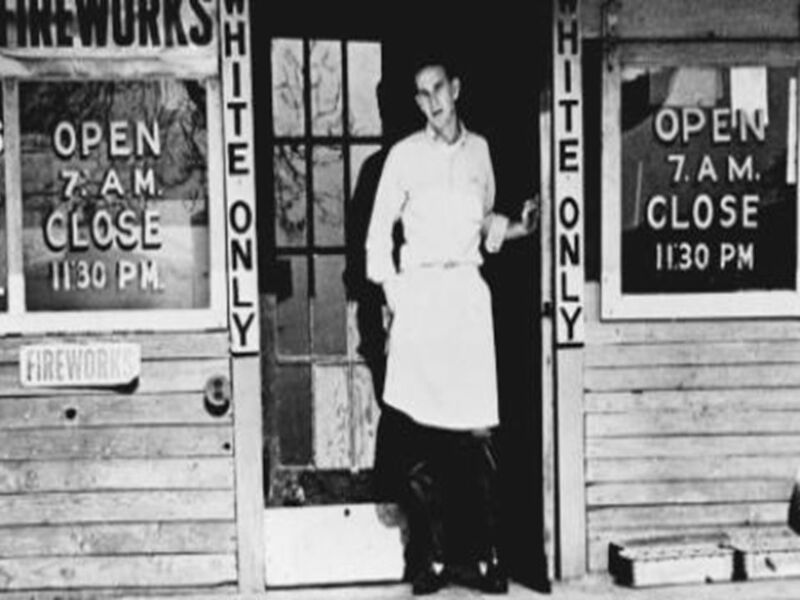 It most states it was illegal for whites and blacks to use the same types of facilities.Legal segregation of the races, however, still governed the southern way of life in the early 1950s. It most states it was illegal for whites and blacks to use the same types of facilities. 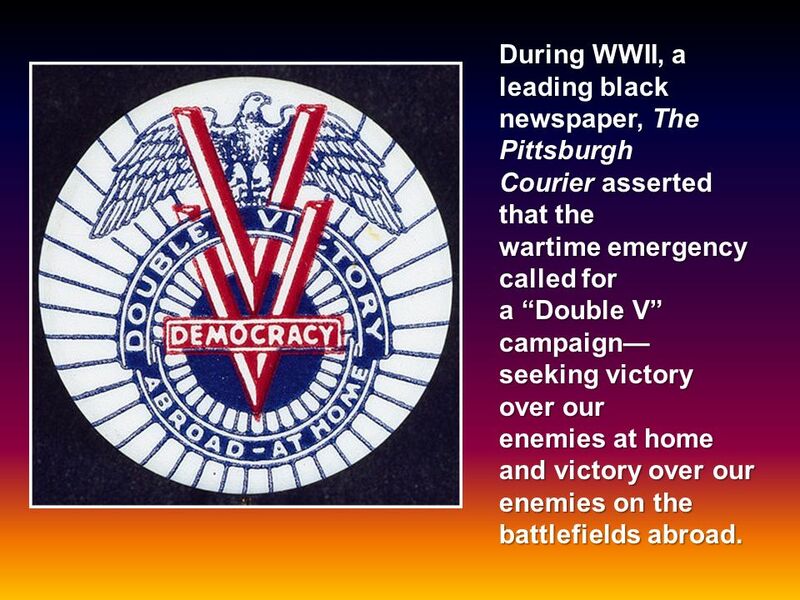 4 During WWII, a leading black newspaper, The Pittsburgh Courier asserted that the wartime emergency called for a Double V campaign seeking victory over our enemies at home and victory over our enemies on the battlefields abroad. 5 Every southern state mandated rigid segregation in public settings ranging from hospitals and schools to drinking fountains and restrooms.Every southern state mandated rigid segregation in public settings ranging from hospitals and schools to drinking fountains and restrooms. Voting laws and practices in the South disfranchised the vast majority of African Americans in that region; employment discrimination kept them at the bottom of the economic ladder throughout the country.Voting laws and practices in the South disfranchised the vast majority of African Americans in that region; employment discrimination kept them at the bottom of the economic ladder throughout the country. Although black protest was as old as American racism, in the 1950s a grassroots movement arose that attracted national attention and the support of white liberal-minded individuals.Although black protest was as old as American racism, in the 1950s a grassroots movement arose that attracted national attention and the support of white liberal-minded individuals. Pressed by civil rights groups, the Supreme Court delivered significant institutional reforms, but he most important changes of all occurred among blacks themselves.Pressed by civil rights groups, the Supreme Court delivered significant institutional reforms, but he most important changes of all occurred among blacks themselves. Between 1940 and 1960, more than three million African Americans moved from the South into areas where they could vote and exert political pressure.Between 1940 and 1960, more than three million African Americans moved from the South into areas where they could vote and exert political pressure. Black leaders made sure that foreign policy officials realized how racist practices at home handicapped the United States in its competition with the Soviet Union for new allies.Black leaders made sure that foreign policy officials realized how racist practices at home handicapped the United States in its competition with the Soviet Union for new allies. 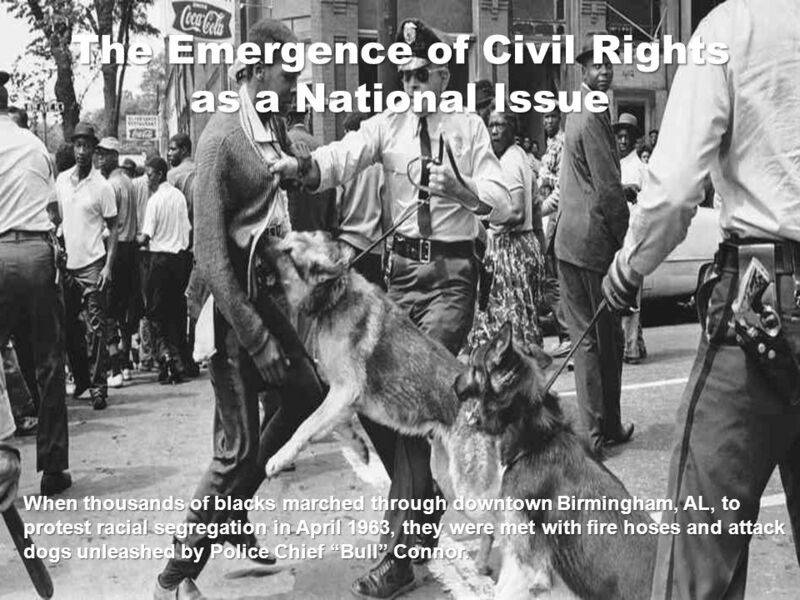 Download ppt "The Emergence of Civil Rights as a National Issue When thousands of blacks marched through downtown Birmingham, AL, to protest racial segregation in April." Objectives Describe efforts to end segregation in the 1940s and 1950s. Segregation NO COLOREDS ALLOWED. Definition: seg·re·ga·tion n. 1. The rule or practice of separating people of different races, classes, or ethnic groups. The Civil Rights Movement Also known as Jim Crow Era 1870s – 1960s Congress freed the slaves but they failed the ensure their freedoms. 1. This amendment banned slavery in the United States. A) Jim Crow B) 15th C) 13th D) 14th. Birmingham Campaign SCLC chose to confront segregation in Birmingham in the spring of Birmingham was one of the most racially divided cities. 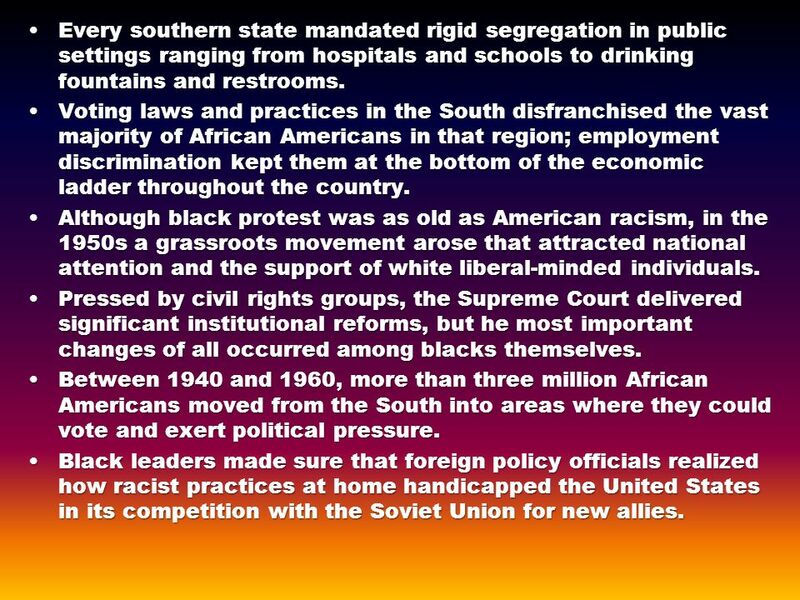 African Americans Demand Civil Rights Objective Summarize the rise of the civil rights movement. Jim Crow Laws. “All railroads carrying passengers in the state (other than street railroads) shall provide equal but separate accommodations for the white. Unit 6: The Great Depression and World War II (1929 – 1949) African-Americans continue to develop their culture and establish their place in American society. The Struggle for Civil Rights. A Brief History of Civil Rights to the 1950s 1863: Lincoln issued Emancipation Proclamation, ending slavery in the South. Integrated prom How is it that Wilcox High has been having segregated proms all this time? Who in Wilcox county is organizing to have an integrated prom? Paperwork Stuff Does anyone still need to take the Chapter 13 test? HW check – 14-1 Reading Notes. THE MODERN CIVIL RIGHTS MOVEMENT Taking a walk With Civil Rights Leaders and established laws for African Americans and Women. 1960’s Civil Rights. MLK When we talk about Civil Rights, what springs to mind? Chapter 25 Section 1 The Cold War Begins Section 2 The Movement Gains Ground Describe the sit-ins, freedom rides, and the actions of James Meredith in.